I've always been a fan of New Year's Eve. Granted, my plans have changed dramatically through the years from staying out all night, to dinner with friends to fun in the sun like this year. Newlywed/friends , Kim and Bob Mills, were recently married but decided to wait to combine their wedding celebration with a New Year's Eve party. The results were outstanding! Cruising down the Intracoastal in Ft. Lauderdale with about 60 old and new friends dancing, drinking, eating and enjoying the holiday lights on the multi-million dollar homes and boats was a night we will never forget! But what did everyone else in Chicago do on NYE? I was very curious so I quizzed some of our town's VICs (Very Important Chicagoans) to find out! Nate Berkus, even though he doesn't live in Chicago anymore but will ALWAYS be considered a hometown boy by moi, spent his NYE at Playacar Palace in Cancun celebrating party guru Colin Cowie's 50th birthday with Padma Lakshmi, Jason and Haley Binn, NBC's Ted Harbert, Clear Channel's Bob Pittman and Chef Todd English. Natalie Cole sang "Unforgettable." Glam It Girl, Gayle Anthony, reported that her equally glamorous sister, Julie Weindling and her beau Phil Geier, spent NYE at Round Hill, Jamaica, rubbing shoulders and chatting at the pool with Sir Paul McCartney and his family, including his daughter by Heather Mills. Also seen poolside were Ewan McGregor, Ralph and Ricky Lauren and Lauren Bush. Entertainment reporter/uber-scribe Bill Zwecker and partner, Tom Gorman, spent their NYE at Linda Johnson Rice's "spectacular" mountain-top home in Palm Springs with Desiree Rogers, Neal Zucker, James Bell (Boeing CFO) and his wife, Sue Leonis and Julie Latsko among others. Author Sherrill Bodine and hubby John, spent their NYE at the famed Windsor Court Hotel in New Orleans. CS Magazine Editor and Chief, Korey Huyler, and her family usually go to Deer Valley but this year, since she's expecting her second child, they stayed in watched a movie and made dinner. Watch out NEXT year Deer Valley! Auctioneer extraordinaire, Leslie Hindman, spent New Year's with friends in Paris dining at Le Grand Colbert. Dapper Sepia Restaurant owner, Emmanuel Nony, hosted over 17o guests at his restaurant before heading to Saugatuck, Michigan, the following day. Henson Consulting founder, Kathleen Henson, and her hubby Mike had a quiet NYE (and with her crazy life I don't blame her!). They ate sushi at a friend's house and played Guesstures with their FIVE children! That's enough excitement for anyone! Myra and John Reilly opted to do the same, staying at their magnificent home in Lake Forest with friends and family. And photographer to the stars, Steve Starr, spent New Year's photographing friends at Rumba Supper Club enjoying live music by the Mannix Martinez Orchestra. Orchestra leader/pianist/entertainer Stanley Paul led the NYE celebrations at the Casino before heading off to his rental mansion in Palm Springs, which was the former home of actress Marjorie Main. Stanley describes it as "Grey Gardens on steroids!" What the hell is a VIC and who are these people? If they are so important, I'd have heard of a few of them. I think you mean VRC, Very Rich Chicagoans. Hi Chris! First of all Happy New Year! VIC is a term I made up to denote Very Important Chicagoans. These are people that are well known around town and who responded to my request to send me their NYE plans and a photo. Not all are rich, not by a long shot, so you're very wrong on this count. And I'm sorry you haven't heard about them but then that's why my blog is so much fun! Now you have! Have a great 2012 and thanks for the comment. I think it's great that these people I never heard of had a nice NYE but why should I give a rat's arse? Big up big up, it's stick up stick up. 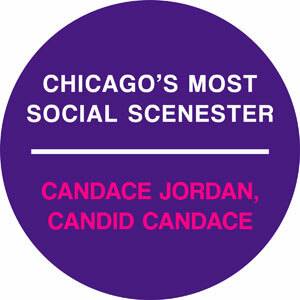 Chicago loves you Candace. You're way too kind. I on the other hand am not. Ha. Your blog and column and show are always positive and upbeat. As im sure you're aware: You know you're a success when folks like the previous posters creep out of their anonymous caves in a futile attempt at making others feel as miserable about life as they sadly do. Keep spreading your love as I know you will. The world needs more of you. "They" will never get it. Let's hope they will someday. And yes I'm proud to be a personal friend of yours.